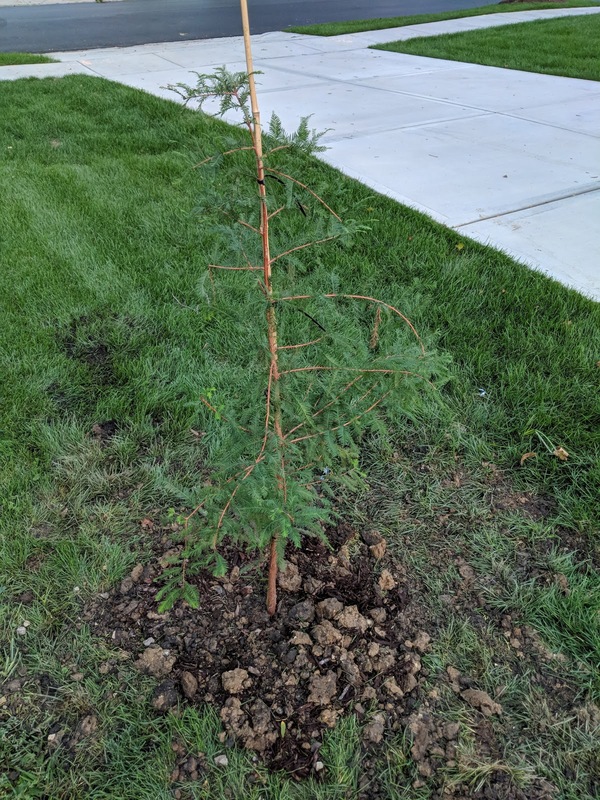 I mentioned in a post that I picked up a late-season Bald Cypress tiny tree at Home Depot recently, but didn't want to mark it down (officially. Or as official as a blog post here counts as...) as the 26th tree that we've planted since we moved in. But, now, you can see in the photo above that it is, indeed in the ground. So we're now at 26 trees. Full list is at the bottom of this post. 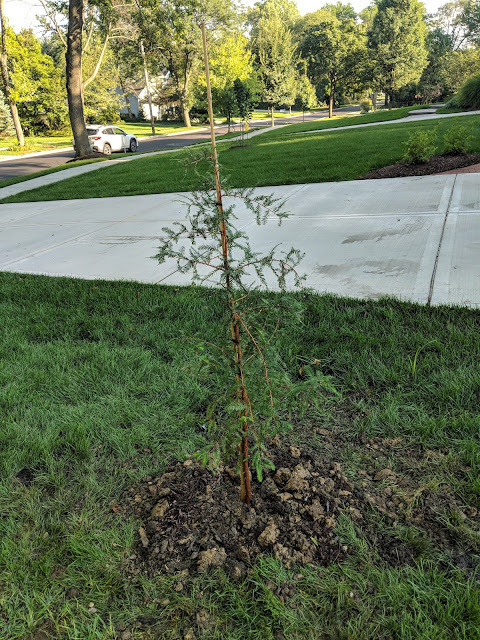 As I mentioned in the post when I showed off the newly purchased Bald Cypress, this is a tree that we've been stalking for some time. I *almost* pulled the trigger on a large one at the Growing Place that had a columnar habit, but passed on it at the last minute. I have a feeling I'll be back next year to buy *that* tree. But for now, we'll have to try this little guy. The reason for the little one is both because it was cheap (sure! ), but also because of where I planted this thing. I wanted it to go in the front yard, between our driveway and the neighbor to the north's driveway. It is a similar location to the large Chanticleer Pear Tree that we've had replaced once and is struggling again this year. I'm pretty sure that the Pear tree is drowning from the clay bowl that it is sitting in but I've tried to reduce some of that by digging a few radial trenches and digging deep down. Now, what about smaller trees? The Chanticleer Pear that has had a difficult time (twice!) is a 3" caliper one. I've also planted two of my own Chanticleer Pear trees in different spots (one high spot in the yard, one low spot in the yard) that were 1" caliper trees that have done remarkably well for me. Thus, my conclusion is a combination of issues: clay bowl + caliper size = struggles for the tree. For this Bald Cypress, I know that it does well in wet areas and would likely do just fine in a clay bowl that retained water. But, I also wanted to try to give it some room to breath. The location that I picked is downhill from the Chanticleer Pear, but also in between the pear's location and the spot I was digging was the exit for one of our buried downspouts. That meant that when we get rain, this location was going to get some water. I went to work and came home and got busy with my post hole digger. I decided to see if I could get to the bottom of the clay. 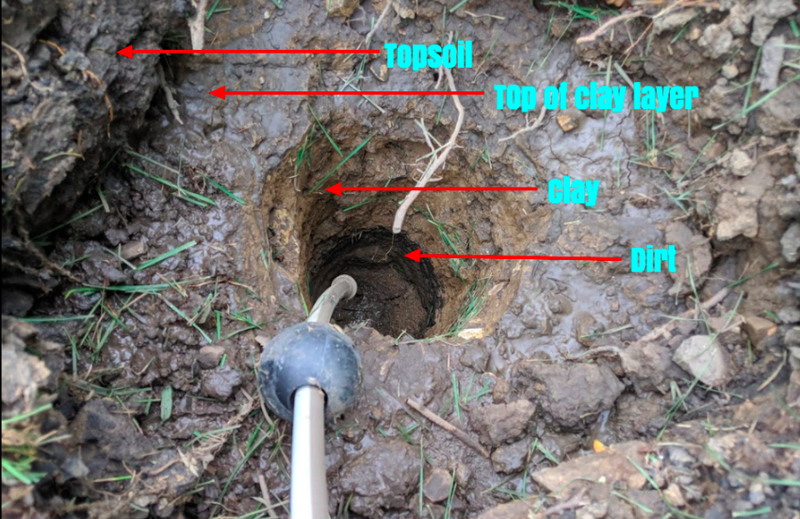 Sure enough, with the post hole digger I found out where the clay backfill ended and the earth started again. 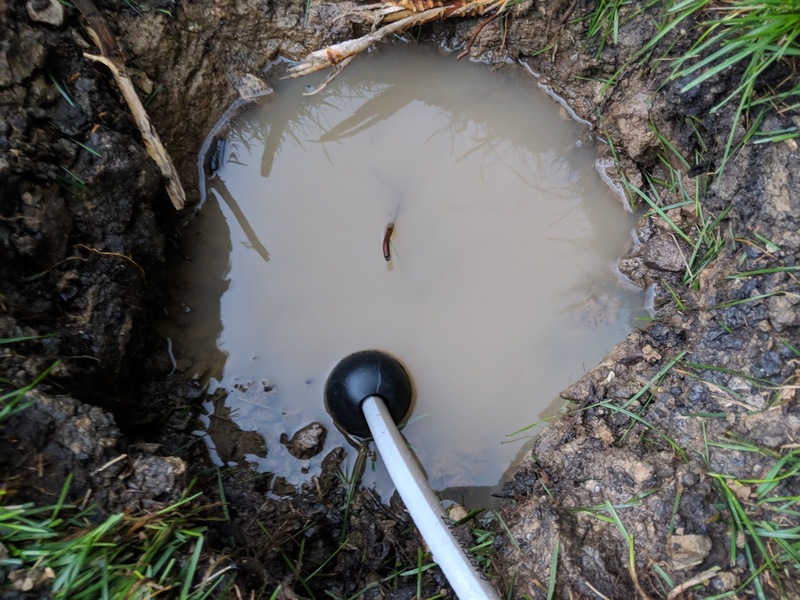 Below a few inches of topsoil, we had three solid feet of clay and then finally, dirt again. I dug and dug and once I figured this out, I used the post hole digger to dig the entire hole. I went 36" round (3X the root ball) and almost four feet down to get to dirt. I then took the hose back and filled the entire hole. It still didn't drain immediately. But within about 15 minutes? The water had drained out. I *think* I had solved the issue of the clay bowl. Now I had to fill the bottom of the whole - and I decided to use a combination of mulch and gravel. With the goal of making something that water could pass through. I built up layer after layer incorporating some of the clay back in, but mixing it with mulch, gravel and pelletized gypsum. Finally, I was able to put the Bald Cypress in the hole and cover it up. I didn't step on/smash the area around the rootball. I figured having some air to breath would be good and that the water/rain that was coming would help do the job naturally. So that's the story of #26 - which is also the second deciduous conifer we have planted. You can see in the photo above that the Bird helped me plant the tree and she was in charge of watering the root ball in that day. 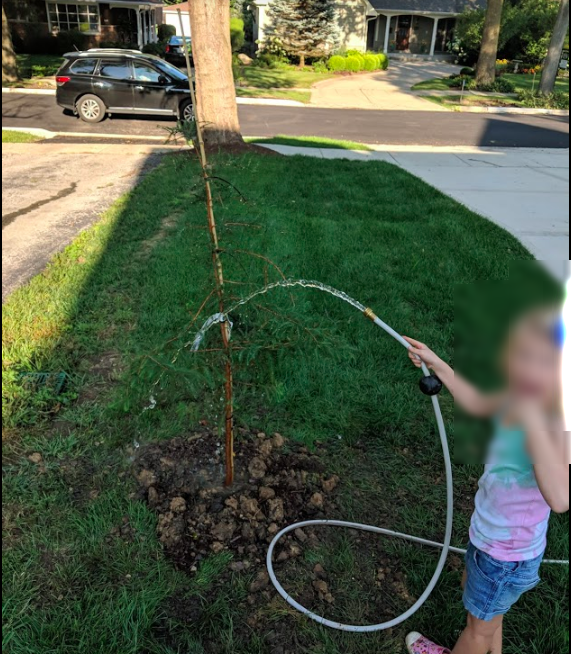 I'm going to try to watch this tree closely this fall and ensure that it has enough water to be happy. These photos below you give you a sense for the location vs. the driveway and our street. Full list of trees planted at Hornbeam Hill since we bought the place in 2017.